Enjoy Utah! : Did You Know: Kanab is Utah's "Little Hollywood"
Did You Know: Kanab is Utah's "Little Hollywood"
Kanab has become known as “Little Hollywood” after the term was used as early as the 1950’s by people in the movie industry. MGM liked Kanab so much they built a makeshift studio outside of town in the 1940s. More than 100 motion pictures have been filmed here. More Westerns were produced near Kanab than anywhere outside of California. Clint Eastwood John Wayne, Ronald Reagan, along with a host of movie stars made movies here. The Clint Eastwood classic, The Outlaw Josie Wales, was one of the last films to shoot on the Paria Canyon movie set. The original set has been relocated to Frontier Movie Town in Kanab and Frontier Movie Town hosts free movie set tours. 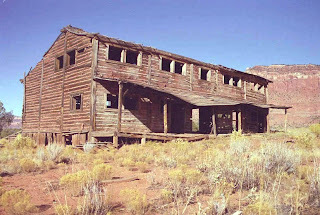 Rookie film maker Danny Daneau came to Kanab to film the The Attic Door in 2007 and filmed near Paria and in Kanab City at the historic Heritage House. Nearby Lake Powell was the location for Maverick, Hulk, Broken Arrow, and both versions of Planet of the Apes.